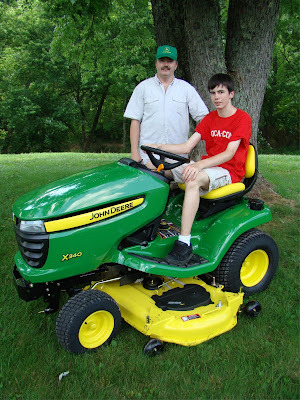 We just wanted to show off the new John Deere x340 lawn tractor donated by individuals of Hope Church in Mason, Ohio! Also, the Happy Shack is getting really close to being done! Pictures soon. We just did the floors! Centerville, Ohio, Grace Brethren Church was here a few weeks ago for floor repair and cabinet hanging. Ned Denlinger (Tri-State GBC coordinator) was here finishing the plumbing and installing sinks. The Point Community Church from Frankfort is coming tomorrow to blow in insulation and run hard lines to the church parsonage and Happy Shack. At least one Nazarene Church is considering ways they can be a part of our ministry. Our live Internet feed has been growing in attendance. Our IT guy stated that over 800 people have watched our worship live and we cannot presently track the archived viewers, but we think it is growing, as well. Thank you, thank you, thank you for helping us as a mission in the most impoverished area in the USA spread the message of hope in a seemingly hopeless area.